Moving is an often-stressful experience that happens to everyone at least a few times in life. The thought of undertaking such a task alone is overwhelming, and the thought of trusting all your worldly possessions to a company you don’t know can be anxiety-inducing. Despite the uneasiness involved, most people faced with a residential or commercial move take the latter option. Hiring a full-service moving company is about finding a company that can offer the services you need at the price you want, with a staff you can trust. At Acclaimed Movers and Storage, we've been providing luxury, full service moving for the better part of a decade for all different types of moves-great and small, local and long distance, commercial and residential. We make it our priority to ensure the safety of every customer’s personal belongings and the peace of mind that comes with an efficient, effective move from Point A to Point B. We know how hard it can be to move. Your home or office is your whole life: from family heirlooms to kids’ artwork, from important paperwork to business files of every kind, we know that your things are of the utmost importance. That’s why we here at Acclaimed Movers and Storage strive to create a level of comfort and compassion that you can rely on to give you an impeccable, unbeatable moving experience. We always treat your items with the utmost care and consideration, as if they were our own. You’ll never find us skimping on our excellent quality or cutting corners. With every customer, on every job, we are committed to providing excellence. Whether you are moving down the street or across the globe, we are with you every step of the way. Our team of specialized consultants will work with you to personalize your moving experience and meet every need specific to your unique move. Getting a quote has never been more simple: just enter your information in the quote generator featured on our website, and you’ll have an idea of how much your move will cost in about a minute, from the comfort of your home or office. Our moving consultants can also offer a quote over the phone if you call the number 888-668-3703. The most recommended method of obtaining a quote, however, is to schedule an on-site evaluation. Our trained, professional representatives can come to your home or business to conduct a comprehensive evaluation of the moving space and determine the price of your move in order to provide a free, no-obligation quote. Our prices we issue are "Not to Exceed,” which means that the quote you’re issued is the price you will pay, guaranteed. We know there are rogue moving companies out there who will try to take advantage of customers by luring them in with a low price only to raise it later when the customer has no way out, and at Acclaimed Movers and Storage, we are committed to breaking this stereotype. You won't be surprised by any add-on fees in the end, and you can rest assured that you're being well handled by our devoted team of consultants and movers. Call Acclaimed today and find out what we can do for you and your unique move. We employ a staff of trained, knowledgeable representatives who are available to answer any questions you might have before, during, or after your move. These employees are with you from start to finish, and will help with every aspect of your move, including the planning and preparation. Our movers are full-time employees of our company, not day laborers or temporary help, and they are dedicated to our company name. They're trained in-house in the art of packing and wrapping, the disassembly and reassembly of furniture, and the handling and transport of high-end items such as pianos, pool tables, art, etc., as well as bulky or oddly shaped furniture. We provide our movers top of the line, industry-leading equipment to enhance the quality and efficiency of every move. Our company trucks are eco-friendly and run on bio-diesel fuel, lowering our carbon footprint and providing a "green" moving experience. Each truck proudly bears our company name and is fitted with a GPS unit for to-the-minute updates on every move, no matter how great or small. Because we're locally based in California, our movers are accustomed to navigating obstacles such as traffic jams, narrow and/or winding roads, custom architecture, and historical districts and homes. We take the time and care to cover every floor, wall, corner, and stairwell that we pass during the loading and unloading process. We provide private storage crates for our 100% secure, climate-controlled facility, where you have both temporary and long-term storage options. We can transport any vehicle, including luxury and classic cars, with both open and closed trailer auto-transport options. I never thought I would have such a great experience with Acclaimed Movers and Storage. The thought of people moving my things, especially my collections, made my anxiety rise and caused extreme stress. Thankfully, this wasn't the case with Acclaimed. My worries decreased a bit when I spoke with the consultant and got a pre move checklist as well as other tips for moving, like using extra packing peanuts or bubble wrap for the breakable items and getting rid of things that I don't use anymore. Finally when moving day came and I saw how professional the movers were, the rest of my stress and anxiety melted away. Acclaimed Movers and Storage completely nulled my fears of people moving my things, and I will definitely be using them in the future. With so many people moving in California these days, you have to have a moving company that you can trust. Thankfully, I know from personal experience that Acclaimed Movers and Storage are (in my opinion) the best movers in California! We used them three times and have not been let down once! The people moving our items were very professional and all around great to work with. I highly recommend Acclaimed for anyone moving, you're not going to be a better experience! 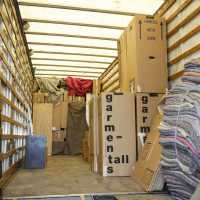 When there are alot of people moving, they need a reliable moving company. Thankfully, for me, I found Acclaimed Movers and Storage. I had done alot of research beforehand and Acclaimed seemed like the best company to fit my needs. I was right, because they did everything I could ask for and even more. A fantastic moving company for people who need help moving. Highly recommend!